THE 8-STOREY building that collapsed in Istanbul on Wednesday has killed at least fifteen residents and injured dozens more. 9 of the victims were from one family. Health Minister Fahrettin Koca confirmed the death toll as 15. It’s feared that the death toll would rise. Hundreds of rescue workers have been working tirelessly to retrieve people trapped under the rubble. Many people have been saved so far but rescue operations are continuing. It is not clear how many people are still stuck in the debris. The building, in Istanbul’s Kartal district, collapsed around 4 pm local time, but what caused to disaster is still unknown. Istanbul chief prosecutor’s office said it has launched an investigation into the collapse of the 27-year-old building. While visiting the disaster site, Binali Yildirim, ruling government’s Istanbul mayoral candidate and current parliament speaker said, “Rescuers have made contact with four others still inside the wreckage. 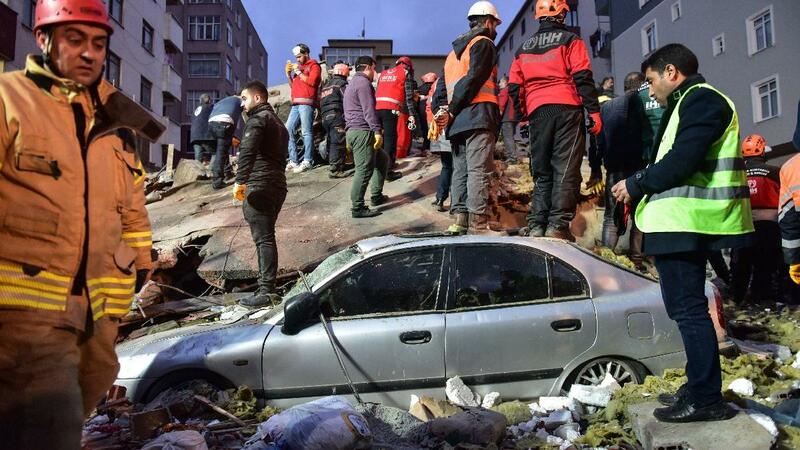 Racing against time, the teams are working, making great sacrifices.” Yildirim said neighbouring buildings had been evacuated in case they had been affected by the collapse and therefore also unsafe. Authorities have reported that most of the residents were not in the building at the time of the collapse as it happened during working hours. Istanbul Governor Ali Yerlikaya said that the building had 14 apartments housing approximately 40 people. “The top three floors were illegal,” he said. Yerlikaya added that three of the injured were in serious condition and currently being treated in the intensive care unit. Ten of the eleven who had lost their lives were identified. Disturbing security camera footage aired on Turkish channels showed school children fleeing the building as it was falling, surrounded by a dust cloud. A court order was issued banning the broadcast of the incident. The Union of Chambers of Turkish Engineers and Architects, TMMOB, claimed yesterday that the collapsed building, with three alleged illegally built floors, was legalised with due regulation in May 2018. The regulation, called ‘zoning amnesty’, had legalised the building in exchange for a proportional fee. According to Koymen, three percent of the sum of the building’s value and the land value was the amount required for the building to be legalised.